The Vestibule is the first room visitors enter. The shape of the room and its decor conjure up the quiet sanctity of a Gothic chapel, enhancing the medieval atmosphere. 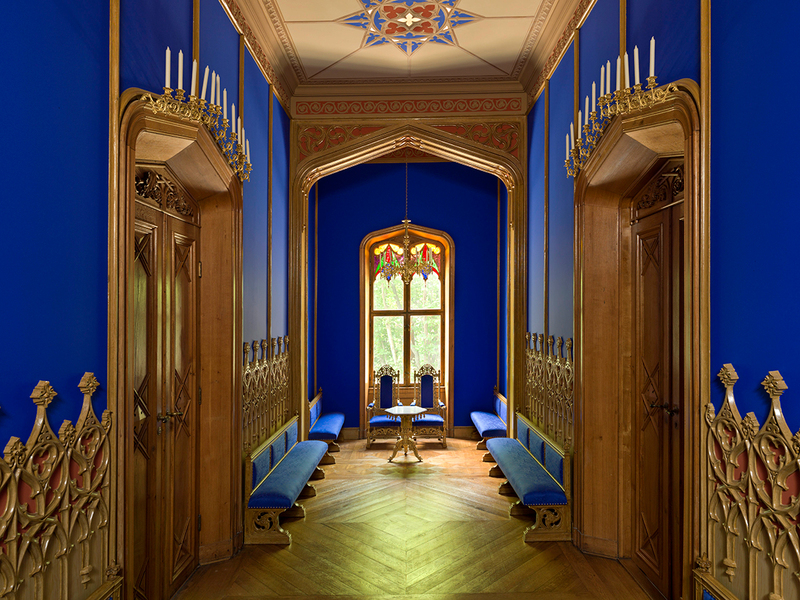 The room is painted a deep ultramarine blue. The daylight enters through a stained glass Gothic arch window on the north wall and a rose window to the south. Two typical Tudor arches divide the rectangular room into three sections. The lower part of the walls is covered in Neo-Gothic panelling that appears to be carved out of wood. In fact the panels are moulded in Portland cement and grained to look like oak or birch. Graining is a technique whereby a material is painted to give it the appearance of wood. This type of simulation was relatively new in Norway at the end of the 1840s and gave the craftsmen a chance to showcase their skills. The imitation wood sometimes looked more real than the genuine article and was greatly admired at the time. Graining was regarded as so exclusive that some even chose to use oak graining on oak. 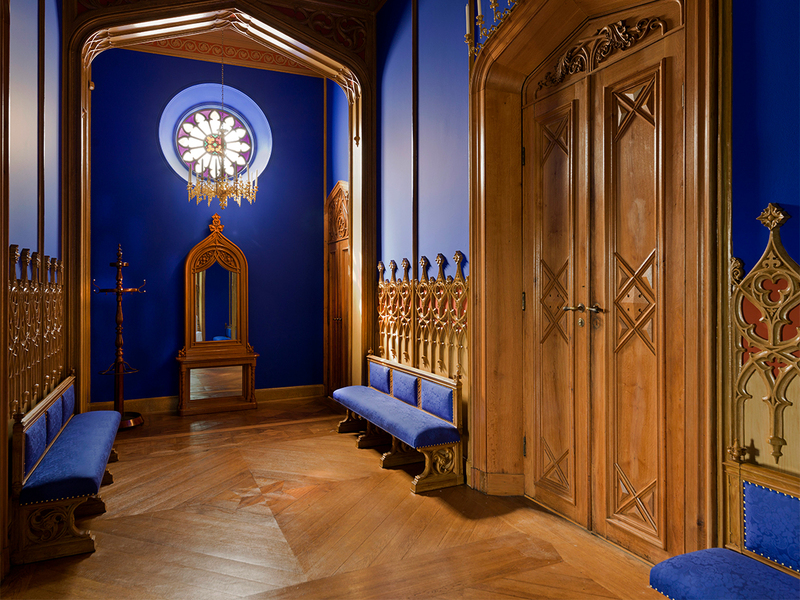 The oak parquet flooring was the work of master carpenter Abrahamsen . It consists of wooden floorboards with a surface layer of oak veneer, a method that was used in several other rooms in the building. A console mirror in the shape of a Gothic arch is placed directly below the rose window, emphasising the Vestibules resemblance to a chapel. The mirror was designed by architect Johan Henrik Nebelong and crafted by master carpenter Christian August Grosch. The two Neo-Baroque armchairs and the small Neo-Gothic marble-topped table were not designed by Nebelong, but form part of the original furnishings. The Vestibule has two Neo-Gothic chandeliers in bronzed brass, and 11 brass wall lamps mounted closely together over each of the two main doors. As electric lighting has never been installed at Oscarshall, the chandeliers remain in their original form and can only be lit using candles. The Vestibule originally served as a cloakroom. In the 1850s a blue, wool damask curtain was hung to separate the smallest part of the room from the rest. This allowed visitors to have some privacy while freshening up in front of the mirror, in what was referred to as the Powder Room. Vestibylen har et nesten sakralt preg. Foto: Jan Haug, Det kongelige hoff.